Jan would rather write than eat or sleep, which is handy for authors—not so much for husbands. Her research as a nutritionist inspired an unusual murder weapon for Heir of Deceit. Favorite writing moment: meeting famous moonshiner Popcorn Sutton while during research in Asheville, North Carolina for Heir of Deceit. She has won national contests for her comedic poetry on subjects such as Black Friday and her messy kitchen. Some are included in her humor book My Word, That’s Absurd! along with her prize-winning children’s story, Miss Mousie and Mrs. McGreggor’s Closet. 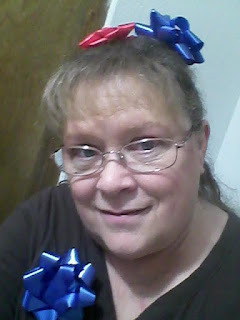 Jan’s quirky sense of humor could classify her as eccentric, but she prefers the term “crazy.” She is the author of two novels, Heir of Deceit and Impressions of Innocence and a non-fiction humor book, My Word, That’s Absurd! She’s going nuts deciding which of seven book ideas she wants to work on next. She loves cactus flowers, road runners, horned toads (and people). She enjoys cooking, teaching, and learning. The day she stops learning will be the day she stops breathing. She and her husband are the parents of six children. Jan wrote for a local newspaper at age 11. She worked for her high school and college journalism departments, and as a case worker, tobacco prevention coordinator, and nutritionist. In addition, she has taught religion classes to high school students for more than 31 years as a volunteer. P.S. If you enjoy her books, she’ll love you forever if you leave a 5-star review on Amazon about them. On the eve of her wedding, Lacey uncovers a problem too large for love to conquer: a family curse which causes the women to kill the men they love, and puts her fiancé, Evs, in danger. Lacey vows to uncover the secrets of her lineage, even if it requires her ultimate sacrifice--the loss of her marriage to her beloved Evs. Her search leads to the Smoky Mountain backwoods, where the shotgun is more respected than the law, and family may not be what is expected. HEIR OF DECEIT is set in an area, where, even today, hands of tobacco are used as currency, and moonshine stills explode. Heir of Deceit is a clean Romantic Mystery suitable for teens and adults. 1. Tell us about things you enjoy—what do you do for fun or personal satisfaction? I especially enjoy studying for and teaching early morning seminary classes to high school students, which I have done for over 30 years. I love to learn. I read lots of non-fiction. I like to study nutrition. I love to cook and serve a satisfying meal to my husband, and make up recipes. I like to sing, although I’m not good at it. I like to make up silly songs for my children. I love to find silly ideas and make up poems about them. (Okay, that’s writing, sort of. Recreational writing). I love giving things away. It makes me a poor salesman. I like to challenge myself to do things that normally frighten me, such as musical solos, making up songs and attempting to write a score for it (no training or talent—all bombs). I like to search out little known fun facts to surprise and delight my students. So long ago I can’t remember. I wrote stories for my friends in grade school. Again in grade school, a fly kept buzzing my head while I was having a bath. I couldn’t swat it for anything. I wrote a ridiculous poem called “The Educated Fly” which is long lost, and which I likely showed to no one. I like silly stuff. When I was eleven years old, I was the reporter for our 4-H Club, the Pixie Pals. The local newspaper printed my articles, so I guess I’ve been a published author since I was eleven! I NEVER showed my work to a soul until I decided I needed to publish something or die! 3. Have you done anything writing-related that seemed to get a lot of positive response that encouraged you? helped me a lot—got a lot of buzz. Thanks, Victorine Lieske! 4. What is the thing you struggle with the most while writing? And how do you defeat it. Marketing. Hands down. **Oh** I don’t think that’s what you meant. My biggest enemy is not having time to write. When I had a full time job plus my seminary class, which requires 3-5 hours a day for me, I couldn’t write much because I was working 13 hours a day. I began Heir of Deceit during this time, and it took years to finish. Now that I’m retired and have nothing to do, everyone thinks my time is theirs. I still have seminary, plus four other church jobs. How do I defeat it? Frankly I don’t. Everyone suggests carving out a couple of hours every day to write. That never works for me. I have begun to turn people down more often. Another thing I do is write all night. I don’t sleep, but, whatever. For my first novel, I took my phone off the hook when I was home alone. I don’t struggle much with writer’s block. I struggle with people block. 5. What is the message of your writing? Different purposes in different books? Mostly, I want to entertain. I want fun. I write clean stories with characters of good moral character. My stories move fast with lots of action. I like a twist in every chapter so the reader doesn’t dare put it down. I like a touch of mystery and/or tragedy. I write satisfying endings. I try to break a few molds, such as not following the “romance model” in my romances: Boy meets girl~~boy hates girl~~they are thrust together and fall in love~~the BIG MISUNDERSTANDING~~they make up and live happily ever after. I do have different purposes in different books. I have two romance/mystery novels and one non-fiction humor book. Obviously different. I like to put humor in my novels—Heir of Deceit has a lot of humor. I really prefer to curl up with print! However, when my walls began to bulge, I switched to ebook. They are usually less expensive, so I can buy more—even get some for free. They don’t take up living space. They are more portable, and don’t weigh as much to lug around. I can choose to open many of hundreds of books—all at once, if I want to. Of course, electronic screens make my eyes tired. I’m hooked on ebooks. I think authors should offer both. 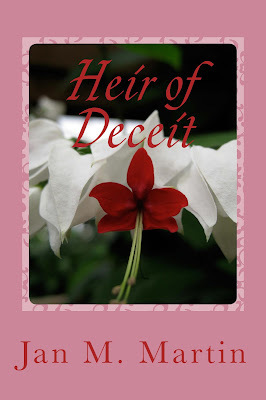 I have begun a stand-alone prequel for Heir of Deceit. Many readers want more of the story of Lacey’s parents’ love story. They also want more of Ruthella and Fergus. Other than the prequel, I prefer separate books. I’ve read a few series books that never end, and you have to read book after book. I won’t purchase that kind. Gotta have an ending, even if the characters appear in another book. Always! How can they not be? In Heir of Deceit, every setting, place, street, legend, and custom is absolutely real—even the restaurant menus! I researched many hours, read at least seven books set in the area, and visited the area so everything would be believable. ALL of the characters are completely fictional. The story is completely fictional. I think it’s pretty original. However, when an author makes up a character, she uses a vast knowledge of human character(s) to model a composite, fictional character. Then, the character takes on a life of his/her own, and develops within the book. Some of the characters are based on my knowledge of similar people, but are definitely NOT these people. In Impressions of Innocence, a good guy became a bad guy. I didn’t plan it that way, he just went awry. “Impressions” is set in a fictional city. That didn’t work out so very well, though. “My Word” is a completely different kind of book. Most of the stories, quips and sight gags are true. It also contains fiction stories. It is a collection of silly stuff. Another is about a young girl who meets a preacher’s son as a child and meets up with him later in life (the dog dies). Another is a non-fiction on how to maintain a youthful look in your older years, If I can pull it off before I’m too *#@^ old. And if I am still alive, a re-write of Impressions of Innocence.